WHAT ARE THE PROFESSORS OF TOMORROW WORKING ON TODAY? Lewis Ingram and Mayna Ratanapongleka are working with healthy participants to create baseline information about healthy hand and arm functioning, which will help motor impairment research. Impairments in the ability to move the hand and arms can result from many diseases and disorders, such as stroke or arthritis, or from normal ageing. These impairments can range from mild to severe (for instance, paralysis). Unfortunately, although this is common and increasing due to our ageing population, there are no standard measures of normal hand and arm function to use as a baseline for documenting upper limb impairments. In a new study, we are adapting the Physiological Profiling Assessment (PPA), so we can use it to assess upper limb impairments. Currently, the PPA, a widely used diagnostic tool, only quantifies lower limb impairments that cause people to fall. The study involves measurement of functional performance in tests that, if defective, would impair ability in everyday tasks. The tests are inexpensive and simple to perform and cover the range of physical movements. These include near-field vision, arm and hand strength, hand sensation, manual dexterity and coordination. We are currently recruiting people across the adult lifespan. That is, 20 men and 20 women per decade from 20 to 90+ years of age, so we can develop robust normative data. Our research will produce simple tests that can be used in population studies and patient group clinics. The information will be valuable for documenting the type and severity of upper limb motor impairments and will enable us to develop strategies to improve function in ageing and disorders such as stroke, Parkinson’s disease, arthritis and peripheral neuropathy. PhD student Amanda Mazzoni is using a non-invasive brain imaging technique to assess the benefits of early learning programs for children with autism. I’m currently working on a study that aims to find out whether an early intervention program for preschool-aged children with autism affects developmental changes in brain activity. 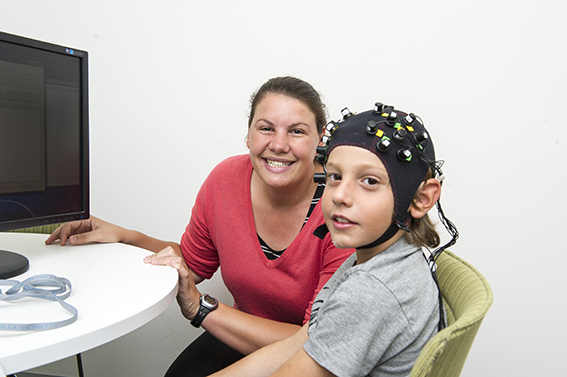 The study will be the first in Australia to evaluate the impact of the behavioural program on brain activity. A secondary aim of the study is to determine whether baseline brain activity measures can be used to identify groups of children most likely to respond to this intervention program. This is measured using functional near-infrared spectroscopy (fNIRS), which is a safe and innovative method of measuring brain activity by projecting light from outside the head into the cerebral cortex, and then measuring the properties of the light that is reflected back. Since the light transmitters and receptors are both in a cap similar to those used for EEG, this provides a way of studying similar aspects of brain activity to those measured by fMRI, but without needing to be in an Magnetic Resonance Imaging scanner. I enjoy being able to spend time speaking with parents and building rapport with children who will take part in my study. This relationship building helps in many ways. Firstly, being familiar to the children allows them to relax and increases the accuracy of the data we get, and speaking with parents shows them the value of research and what the importance of a project like this is to the autistic community. I have started working on a review looking at the practicalities of using near-infrared spectroscopy in autism research and look forward to being able to share these insights with other researchers.